I’ve been on a roll with positive reviews lately and this is another one to add to the total. I’ve never been a Poltergeist fan and didn’t even care for the original one. 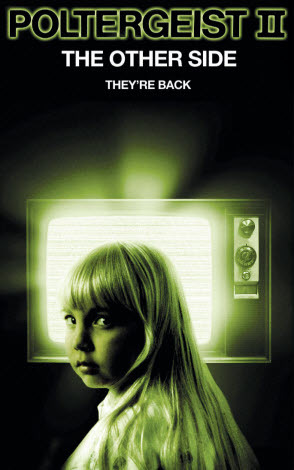 The second Poltergeist film was completely terrible and one of the worst horror films out there. It’s safe to say that I had very low expectations walking into this one, but shockingly enough…it was actually good. It wasn’t even just okay or anything like that, but it was actually really good. I was shocked as I kept on watching and the film kept on being fun. It’s not perfect by any means and the teenagers are annoying, but the film still went above and beyond my expectations. Who knows, maybe a fourth Poltergeist would actually be worth it. Carol Anne is now living with her aunt and uncle. Her parents needed a break from the supernatural threats for a little while or maybe Kane forced them to part ways for a while. They didn’t tell Pat and Bruce about the demons because they probably figured that nobody would believe the story. Bruce is the manager of a super tall building and the family lives in a nice neighborhood. Unfortunately, it it not enough to deter Kane. The spirit returns and begins to haunt everyone in the building. He won’t stop until he has Carol Anne, but she intends to put up a fight. Can she stop him once and for all? First off, this film doesn’t take itself quite as seriously as the first two. It’s still serious, but we don’t have the characters looking solemn and asking sketchy people for help. The new guardians don’t really believe in ghosts and that’s that. I don’t want to call the film campy either. It does its best to be scary as there are a lot of jump scares and Kane is a real threat, but I don’t think you’ll find yourself scared. That being said, the film is nice and atmospheric. If you were to watch this at night, then I think you’d get an extra kick out of it. This film tries out quite a few different plots. One of Kane’s plans involves replacing everyone around Carol Anne with spirit duplicates. Her cousin is taken over along with her boyfriend and slowly but surely they increase their ranks. It ultimately didn’t really go anywhere, but it was still an interesting plot. Unfortunately, this meant that it was curtains for Dr. Seaton. He was only going to last so long anyway, but I was sad to see him go. He was hands down the best character in the film. His complete denial of spirits and the supernatural was pretty incredible given everything that was happening. Carol Anne was a fun heroine to have around. She’s a little too young to be fighting these spooks, but at least she is a nice kid. Carol Anne helps Donna sneak out to the party and tries to keep everything to herself. She doesn’t want to involve the others in this fight so she often goes to battle on her own. Naturally, this is a little dicey since she is outmatched and the ghosts have an easier time when it is 1 on 1, but I can respect her decision to keep everyone out of it. Pat was the mean character of the group. She didn’t want to have to look out for Carol and she made this clear. She had her big moment at the end where she finally became friends with Carol Anne, but it was rather late and hard to believe. At least Bruce was a nice uncle. He did his best to help Carol Anne out and was pretty patient with all of the crazyness that was happening. Towards the end of the film he also did his best to get Carol Anne back from the darkness even when Pat said that they should just leave her. He was a lot more heroic than I would have expected and was certainly the best character behind Seaton. Donna was another mean character. She even states that she doesn’t like Carol Anne while on the phone with her “friends” and naturally the main character hears her. Since Carol Anne is nice like that, she isn’t bothered by it. She just hopes that they can still be pals even if Donna won’t think of her as family. Donna never really gets much better and breaking into the pool and stealing snacks from her Dad’s company just makes the matter worse. Seriously, she is one of the most irresponsible baby sitters that I’ve seen in a while. Her friends were all pretty terrible so no need to talk about them. Dr. Seaton was the unsung hero here. Even when cups would shatter into nothing, Even when Seaton was attacked, Even when reality was warping right in front of him, Seaton was never shaken. He strongly believed that Carol Anne just had strong hypnotic abilities that could affect anyone in an instant. He never dropped this hypothesis even after seeing two kids come back from the mirror world, hands running around, and all kinds of other stuff. Seaton always had a very exhausted look about him since he was tired of the nonsense. He went as far as to head back to the skyscraper when he thinks that Carol Anne is prank calling him. It may have been a fatal move, but you have to like how energetic this guy is. He never runs out of energy and he isn’t afraid to speak his mind. Maybe he would have fared better if it hadn’t been a 2 vs 1 fight in the end. He adds a lot of levity to the film and does it very well. The humor isn’t silly or over the top, but just very direct and to the point. Tangina was one of the big characters in the first two films so it makes sense that she would return here. She actually doesn’t look that great here. Lets just say that she finally meets her match this time and Kane is through playing around. She’s the very definition of a character who is all talk and no action. She gets her hype moment by the end of course, but I definitely can’t say that I’m a fan of her. She does yell a lot though so you’ll certainly have to acknowledge her most of the time. As for Kane, I still don’t really get why he is doing all of this. It seems like he wants her body at some points so he can be alive in the real world again and at other points it seems like he just wants to destroy her for revenge. Regardless of the motive, Kane just seems confused most of the time. He’s persistent though since he is constantly showing up. I guess he’s not bad as a villain, he’s certainly much better than how he was in the second film. While scary may not be the right word to use for this film, I suppose you could call it creepy. There are a lot of scenes involving the mirror dimension where you can see the spirits while the characters can’t. It is a little unnerving to see them hiding in the halls and ready to pounce on the heroes when they get close. The visuals were actually a little ahead of their time here. I’d say that the special effects crew really did their best considering that this film had a very limited budget. The very ending of the film is also pretty hype although not totally unexpected. It’s a horror film so there has to be some kind of twist at the end right? It’s one of those very interpret-able endings so you get to decide what it means. Whatever you go with, it may not end too well for the heroes. Kane doesn’t give up…even when the film is over. Overall, Poltergeist 3 was a surprise hit. The new locale really helped to make the scenery better than the first two films. There haven’t been many horror films that take place inside of a large building like this one and I’d like to see more do it. It gives the film a claustrophobic feel since there is nowhere for the heroes to run. 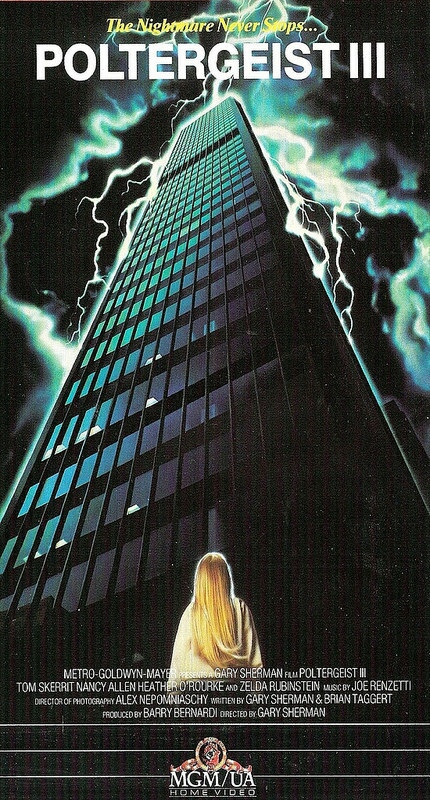 Even if Carol Anne wanted to leave the building, she’d have to go 100 flights and the elevators never work when the spirits are around. It really ups the danger factor because while the uncle and aunt may be in the same building, they are still very far away. (The party is on the ground floor of course) The film never drags on and it’s just a blast. The only subplot that is pretty iffy is Donna’s and it doesn’t get too much screen time. That’s seriously the only thing that I can remember not liking about the film. The rest of it is just super solid. You may think that the building would get old after a while, but with so many floors and different backdrops, it stays unique. The heroes even head to a parking lot at one point with a mystical pool and it made for another very chilling scene. The best way to describe how the film can be kind of scary and yet not really is that it’s very strange. The film has a lot of strange visuals and circumstances which are amped up by the music and it’ll keep you unsettled the whole time. The film also strays away from disturbing insect type scenes like the first film tried to pull and it’s also surprisingly very tame. There is really no objectionable violence to be found here this time. It’s easily one of the safest horror films that it still pretty thrilling and that’s a winning combination. I highly recommend checking out this film. Odds are that you never watched it because you figured that it had to be poorly made since it’s the third film in a series, but that is just not the case this time. Check it out and prepare for an epic experience! They say that it’s darkest before the Dawn. That may be the case for Poltergeist as this film was pretty terrible, but the next one is supposed to be even worse. Int his case, it may just stay in darkness for a while. Poltergeist II was a bad idea from the start, but I feel like it didn’t even try. It had a humorous moment or two during the film, but that’s about all that I can say for it. Steve and Diane are still trying to get over the death of their old house via the Poltergeist monsters. It’s been a while and they’ve mostly settled into the new place. After the mother dies, the Poltergeists decide to make a return. One of them impersonates the lady for a while, but Carol figures out that it’s a trap and warns the other characters that they’re back! One of the ghost busting professionals arrives to help out, but is he really a hero? Where to start with this trainwreck right!? Well, let’s go into the positive part first. I do like how Steve reacts to some of the situations. For example, the Indian known as Taylor went to the family and said that the house was okay after the heroes had nearly been destroyed. Steve then answers that Taylor can stay there since it’s so safe as he dashes off in the car. They really have no reason to trust Taylor after all and the guy is pretty suspect at times. Steve tends to take things in stride and he’s always got a sarcastic comeback for when the going gets tough. That’s the kind of skills that I expect to see from someone like him. Unfortunately, that’s the only real positive in the film. Let’s go back to Taylor. This guy’s a truly pointless character who is full of himself and doesn’t actually help the others. He helps one of the kids try to become a man by giving him scratches with a sharp twig or something of that sort. It was pretty bad and just shows how crazy he is as Taylor talks about how kids fight in wars and such to justify these decisions. Taylor always hides when the villains appear as he prefers to let Steve do all of the fighting. He hangs out in the background until the coast is clear. He also continually lies to the main character about his car being angry so that he can steal it at the end. I don’t see why this character was called int to help at all as he was one of the worst characters. Next up on the cringe worthy checklist is the main villain. Kane is an old pastor who was delusional and thought that the world would end so he buried everyone in a cave and forced them all to die. They apparently lost their minds as nobody thought to try and attack him so they could get out. They outnumbered the guy like 20-1 and they just let themselves die from hunger and thirst? You’ve got to be kidding me. He got supernatural powers somehow and can turn into a giant monster. The monster form looked decently cool I suppose, but its first form was a grotesque looking skeleton that hatched from its worm form. It was pretty repulsive the whole time. Just to make sure that the viewers didn’t like the villain, the movie decided to make him depraved as well. In one of those scenes that added nothing to the film except a death warrant on its overall score, Kane tries to force himself on Diane and the scene is just sooooo terrible. We don’t need more Sword Art Online scenes folks, this is really what doomed Poltergeist II to a 0 although it would have only been a 1 at best otherwise. The focus on the actual ghosts was basically forgotten in this film as Kane was the only true villain. When Taylor talks about Kane, he almost hinted that the guy was the devil incarnate at first, but later on he just turns out to be your average loony. No amount of character development could have made him a compelling villain though. Did I mention that Steve is also very weak when it comes to strength of will? All Kane needs to mind control him in this film is to make eye contact and Steve was instantly unable to do anything about the whole situation. He nearly let Kane in at that point and it’s good that Carol was around. None of the characters seemed to know what they were doing when faced with supernatural threats. It’s also intriguing how the insurance companies acknowledge that the house is missing without actually coming through on the insurance. Really…? Let’s elaborate a little more on how the characters are terrible. Steve knows that Kane could show up at any minute so instead of preparing his will for round 2…he decides to go and have a beer. He’s so drunk that he doesn’t see Kane (Now in the form of an insect) inside of the bottle and swallows him. Kane messes around in Steve’s body for a while before Steve finally spits him out, but why would he be drinking at all in such a situation? Carol constantly freezes with fear whenever the villains appear. You’d think that after the first film she would be a little more used to dealing with supernatural forces right? There’s not much to say about Diane, but she can be a little unreasonable when the heroes were running from the ghosts. Staying in the car was their best strategy after all. Also, where would a bad horror film be without the obligatory bath scene right? As per usual, it’s pointless and shouldn’t be around. It’s not as drawn out and painfully unbearable as in the average film, but it’s still around which is not cool. It’s basically just adding insult to injury by this point. Basically, the key message is do not watch this film. It just had no idea where it was going from start to finish and was a mess. Overall, Poltergeist II is quite bad. It doesn’t really know what its doing at this point. It’s not really trying to be a horror film as nothing even gets remotely horror esque aside from the monster form at the end. All of the characters make foolish decisions and Taylor was a very poorly written “hero”. We find out that some iffy truths about what may have happened with his tribe way back when, but it has nothing to do with anything. This film wouldn’t even exist if the characters made smart decisions. If you want to watch a good horror film….don’t watch this one! 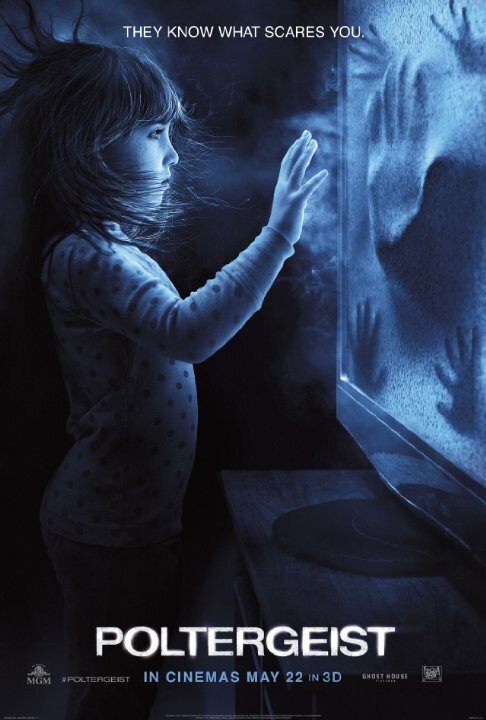 It’s time to take a look at the remake of the original Poltergeist film. I actually saw this film a while back, but the review has been rotting in my backlog for some time now. Surprisingly, I thought that the film was fairly decent and by all accounts…it is actually better than the original film. I know that critics wouldn’t agree and by all accounts…I’m talking about mine. This film doesn’t take itself quite as seriously as the original nor does it feel nearly as long and I almost consider it to be an abridged version. For some reason, I get that vibe from most horror films like I Still Know What You Did Last Summer and the latest The Fog. They all just go by so quickly that the villains barely even have time to hype themselves up a little. A family moves into a new house…and weird things begin to happen. It’s sort of like Five Nights at Freddy’s if you ignore the plot of both items and just focus on the scary jump moments. The family must try to resist the ghosts, but the daughter is taken to the spirit world which certainly complicates matters. The family calls in a version of the Ghost Busters, but even that may not be enough to save them from imminent destruction and complete obliteration. This film is a lot newer than the original so the effects are certainly more polished even if that means that they may not be as “scary” (Still don’t believe that films can actually be scary) There’s no family dog here, which was a big relief and the film is also toned down from the original. One guy’s face doesn’t start to peel off, which is a welcome improvement. There’s still a maggots/roach scene, which is pretty gross and unnecessary, but it could have been worse. As this is a horror film, the characters make as many mistakes as possible to fill their quotas. One guy nearly gets rammed through with a screwdriver/jackhammer but decides not to tell anyone about this. They couldn’t have done anything about it, but sharing is caring right? When it’s not cutting out scenes from the original, this film follows the old plot very closely. As a result, you will know everything that is about to happen before it happens. It’s why such literal remakes are risky since it’s hard to scare anyone when they know what to expect. Honestly, I’m not sure what the film’s gameplan was for this since they didn’t seem to even try and escape from this issue. The film played it close to the cuff and while that’s not necessarily a bad thing, it also limited the movie’s opportunities. Honestly, I’d say that the film was a little on the generic side although it was certainly more tasteful than the average Horror film. I didn’t mind the film all that much while watching it. It could even be fun at times like when the dad brought home pizza and chicken for dinner. The kids were rather ungrateful though and the situation got dicey, but it was neat. Adding in the rebellious teenage daughter was a little much though and one of those modern effects that makes you back up a little. The parents got to go to a fancy party and we actually saw it this time so that was neat I suppose. It’s actually hard to find enough things to say about this movie to fill in the review. It’s the kind of flick that you will essentially forget after a little while because it furfills the cliches of horror 101, but doesn’t try to make a name for itself. Knowing horror films, this is probably a good thing though. Poltergeist actually ends up being the most positively received horror film by this blog in quite a while so it certainly did something right. The actions scene where the heroes try to rescue the daughter from the portal using the rope is still classic. I felt like that plot was handled better than in the original. The clown was a lot weaker here though, but I can live with that since a toy clown should be no match right from the get go. As mentioned earlier, the film’s pacing is a lot quicker and I’d say that this is a good thing. The film doesn’t need to bother trying to develop the characters since they’re mainly here to be scared anyway. Just give them some basic personality and you should be all set for some action. The characters were actually pretty reasonable considering the genre and while the kids were annoying…how could they not be? I’d still take them over the kids in The Shining and Insidious any day of the week. I do like how casually people around the block take the whole house blowing up thing. This should have been filmed in New York, you really wouldn’t get a reaction from those tough blokes. They’ve seen it all and aren’t afraid to remind you of that from time to time. There’s a reason why New York City is known as the greatest place on the planet after all! Now, I wonder if this film will get remade again someday. I certainly wouldn’t be surprised, but it’s a film that should be left alone for a little while. Then the writers can think about how they should improve it some more. This remake added to stars to the score so if they keep up at this pace, the series will be doing quite well! The next remake should be a little different though so surprise the audience a little. Overall, Poltergeist is a decent horror film for what it’s worth, but that’s still not saying a whole lot. I couldn’t really recommend the film because I don’t know why you would be seeing it. If you want something that’s more intense, but less tasteful, then you’ve got the original film. If you want to watch something new and fancy, why are you in the horror genre? 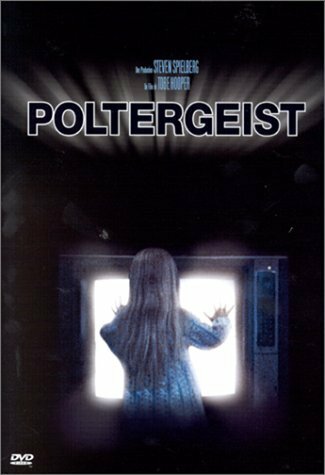 Poltergeist just doesn’t do anything within the genre and just becomes another horror film to be forgotten on the shelf. At least it had the nice portal effects though, I always like those.